Captured with a homemade sound activated flash trigger. I don't have a histogram review and I didn't have my laptop so the pictures were underexposed I didn't know it. That's why there's banding in the background. Aaaagggghhhh! In complete darkness, the flash acts as the shutter, resulting in extremely short shutter speeds. Visit www.hiviz.com for info on the trigger. Very artistic and unique. Your master of technique is awe inspiring. Amazing shot. This is an awesome pic. WOW........ its simply awesome. Im sorry i took this long to comment on this - I found it by accident, while going through cameras section. Its a great pic- there is no blur anywhere - the hammer or pieces of glass. Superb. I like that trigger thing. What a perfect capture! This is absolutely amazing the effect and the impact, just wow! I keep coming back to look at this. How many glasses did you kill trying this? Stunning timing - did you use some kind of trigger device or a lot of luck, patience and wine glasses?!? I like the composition. The hammer and background are perhaps a bit dark and lack contrast, but everything else is quite good. Wow. My only complaint would be about more light on the hammer. Excellent stopped motion shot, great job! Funky! I might just need to see a "how'd they do that" on this one. It almost looks like the glass is not really in motion but frozen in that spot. Is that true? I love how the stem is totally intact, makes for a kind of drama. For technical comments, I'd have tried to make the hammer a bit lighter, but I love the range on the glass itself. How many glasses did you go through!!!!! This is totally awesome, my favorite of the week! Wow that's pretty incredible! How did you get the timing right!! Seems it would be very difficult. Definately an A for uniqueness! I love the way you stopped the motion of the glass breaking. It's a great concept. The hammer seems a little dark to me thought. But that's just my preference. I think it is a fantastic photograph! Wow. Good setup. Your really nailed this one! WOW that's a fast exposure! I love the composition, the contrast. Definitely a 10. You have the basis of an excellent image here...I've honestly never seen such an orderly shattering of glass. Caught at a great moment... The shot nonetheless looks underexposed. A levels adjustment is needed to make some good highlights here :) ... you can also try doding and burning to lighten up certain elements of the photo... Hope you continue to work on it after the challnge!! Great capture. How did you do it? wow! How many takes before THIS turned out this well? How many crystal shards were on your work surface? NICE image! GREAT concept! Well done! Great photo. Really original take on the 'broken glass' theme to include the hammer. Perfectly-timed shutter too - caught exactly the right moment. Excellent. wow. This is one of the very few entries that really caught my attention. I like how the glass still holds it shape and is also completely shattered! This photo is simplely smashing! I like how the light in your photo dfines the edges of the broken glass. It really shattered beautifully, and in such a regular pattern. I hope no wine was injured in making this picture! Was it a bad year for this fine wine? You came up with a different idea, great! A nice shot. How many did you break? Cool idea, fits theme, tricky take! - I'm curious how many glasses you went through getting this shot? Good job! 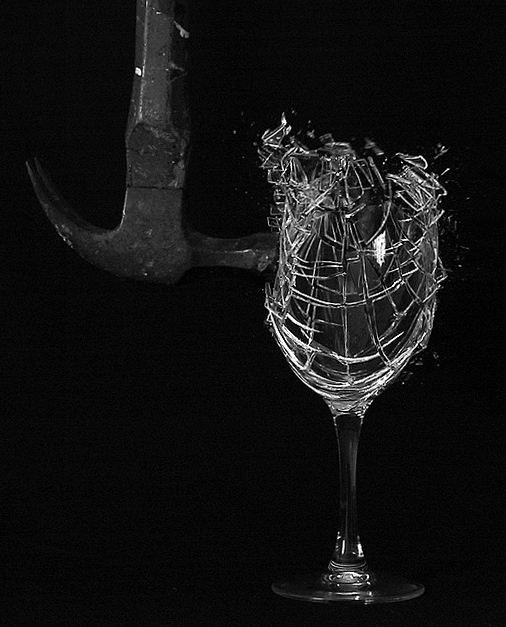 This is a really neat picture, you got the hammer breaking the glass at exactly the right moment. Wow, is that for real or did you set it up some how? How many glasses did it take you? :D Wish it had some sign of movement by the hammer. Proudly hosted by Sargasso Networks. Current Server Time: 04/22/2019 12:39:24 AM EDT.